“I take this opportunity to thank you and Dianne for making this trip of ours memorable. The arrangements were perfect and there were no uncalled incidents. Dianne was very sweet and so was Lakay. The golf courses selected by you were to our satisfaction. The hotel was located centrally and we all enjoyed our stay there. Next year we will come back to Manila and I have told Dianne that one of the courses that we WANT to play will be the Southwoods course. 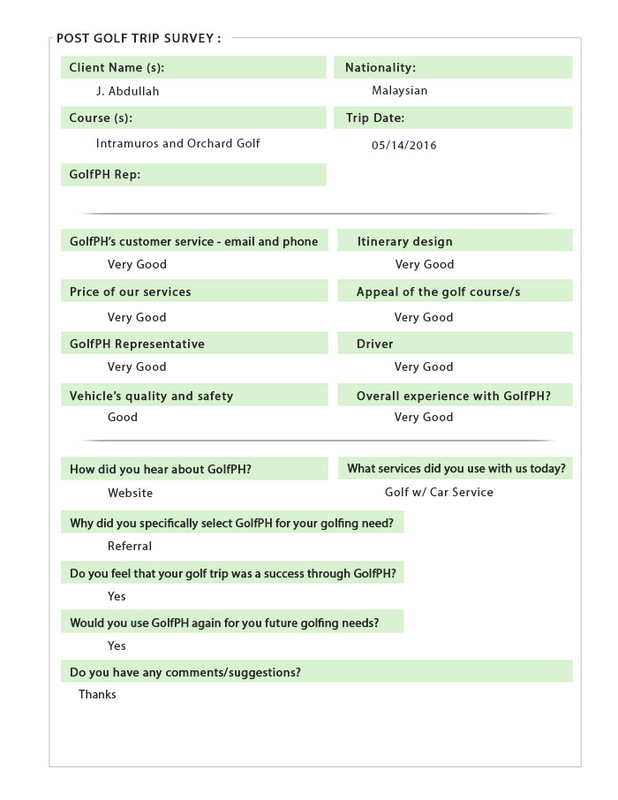 “Just want to share my feedback on GolfPH…. I travel a lot to the Philippines a few times a year, usually for golf and due to the Chinese Lunar New Year holidays, most of my usual golfing local buddies are away and therefore I decided to give GolfPH a try for the first time to book my golfing itineraries. 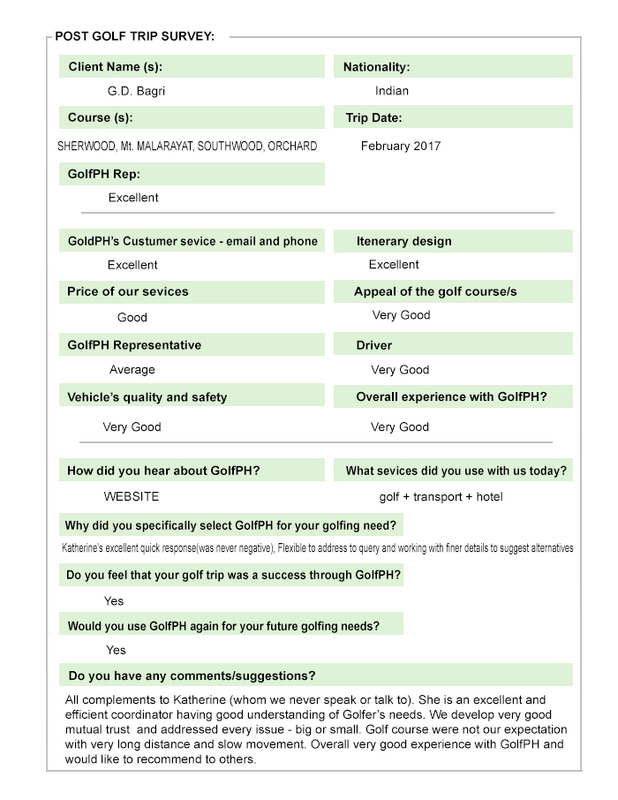 It started with only one booking and Katherine and her team was super efficient in answering my thousands of queries, offering advice on best courses to play during this time and best pricing too…. After office hours and even public holidays never stop them from replying to my e-mails. Don’t think there was any e-mail that was left un-answered for more than 30mins apart!! During this trip, I booked Mt Malarakyat and Summit Point (transport included) and the cars arrived clean and timely too…the drivers was very polite and got us to our tee off time in time, despised the crazy Manila traffic. Mt. Malarakyat is great (a must play for those first time in Philippines) while the Summit course condition is only average this time of the year. After two successful golfing days, we decided to add another booking for the next day – this time Eagle Ridge on a Saturday and no task is too impossible for Katherine and her team as she managed to squeeze us into the Normal course, eventhou usual booking require 48 hours ahead of time and weekends are usually fully booked. To top things off, I over transfer the total amount to GolfPH and Katherine once again so kindly inform me of my ‘generosity’ and refunded back the excess amount. What a service !! For all my future golfing trips within the Philippines, I will look no further and used GolfPH. No hassle – No Worries and best of all quick respond time (no matter day/ night). 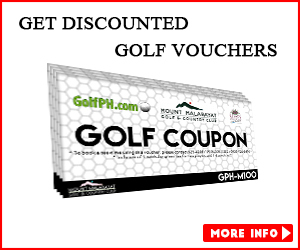 Those thinking of golfing in the Philippines, look no further and send GolfPH an e-mail…. Highly recommended !! 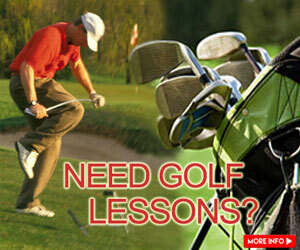 If a friend/realtive/colleague needed golf assistance in the Philippines, would you refer GolfPH? Most definitely. Describe GolfPH in 2 sentences or less. 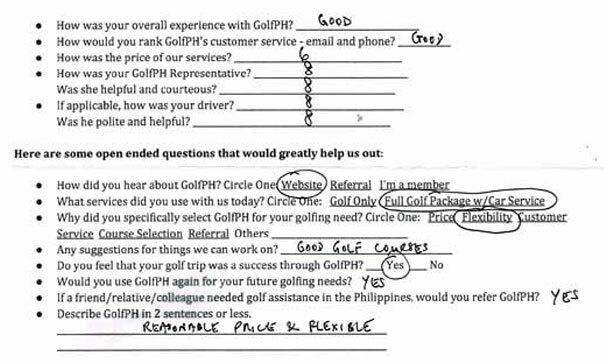 Why did you specifically select GolfPH for your golfing needs? Price. Flexibility. Would you use GolfPH again for your future golfing needs? Yes. 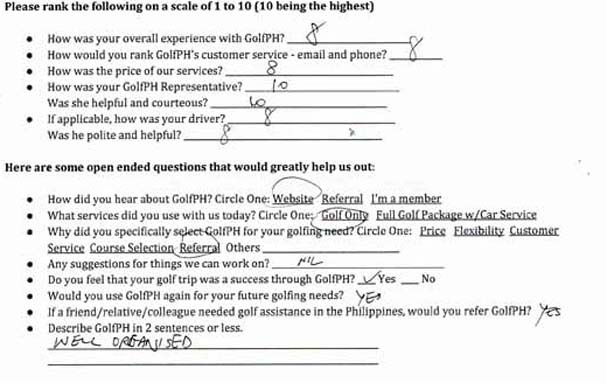 Would you refer GolfPH? Yes. How was your overall experience with GolfPH? VERY GOOD. 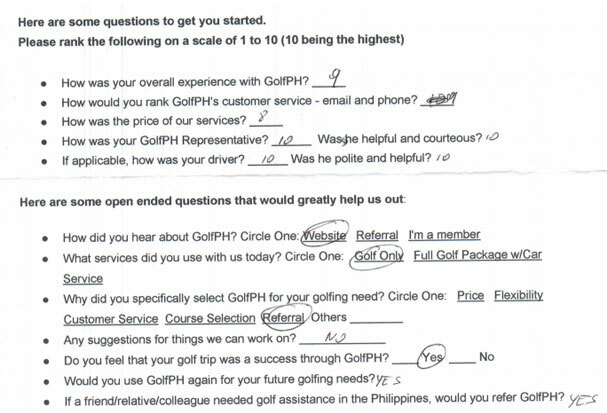 How would you rank GolfPH’s customer service – email and phone? V. GOOD. How was your GolfPH Representative? V.G. If applicable, how was your driver? G.
If a friend/relative/colleague needed golf assistance in the Philippines, would you refer GolfPH? YES. 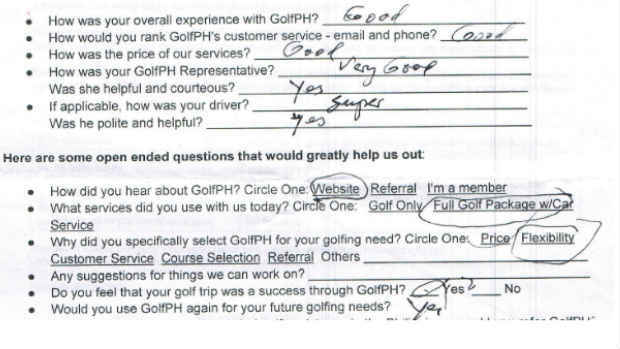 How did you hear about GolfPH? Website. 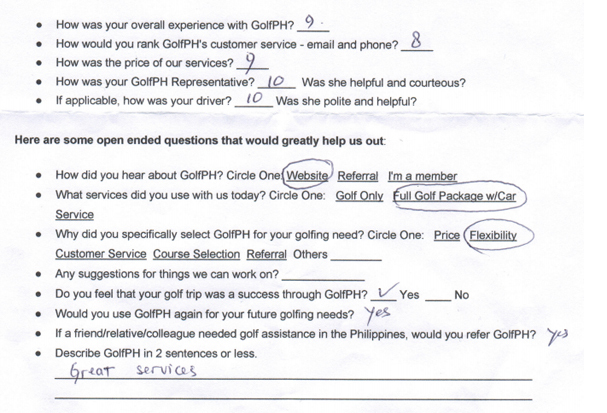 Why did you specifically select GolfPH for your golfing needs? Flexibility. 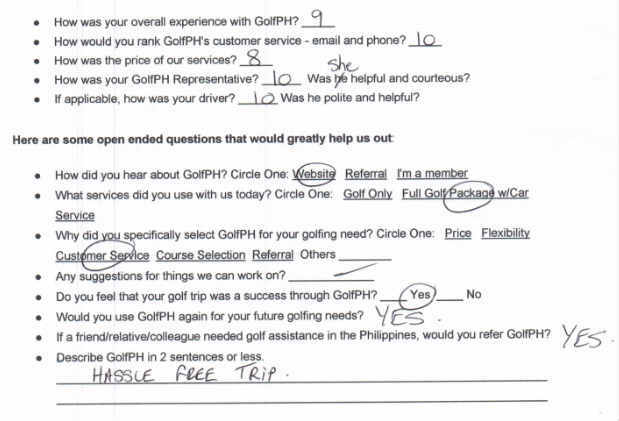 Do you feel that your golf trip was a success through GolfPH? Yes. 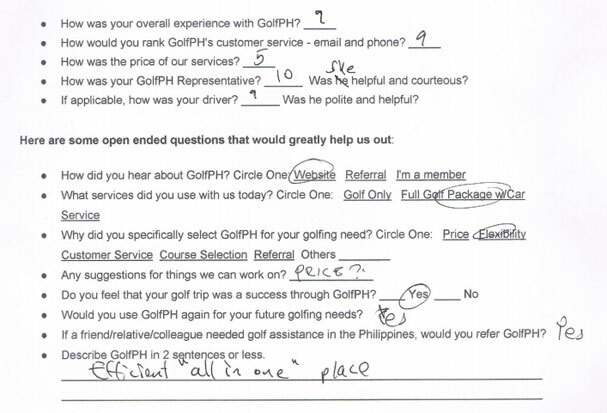 Why did you specifically select GolfPH for your golfing needs? Flexibility. Customer Service. We came back yesterday safely. I want to say that golf trip at Manila is pleasant we were so enjoyed and excited. Thanks for good service from Golfph. Transportation; hotel; Grace, everything is so nice. I am sure I will come back to you when we have the client wanting to travel to Manila next time. Thanks, and you have a good day. How was your overall experience with GolfPH? Good. How was the price of our services? Very Good. How was your GolfPH Representative? Good with a positive attitude. If applicable, how was your driver? Efficient. Polite and helpful? Yes. 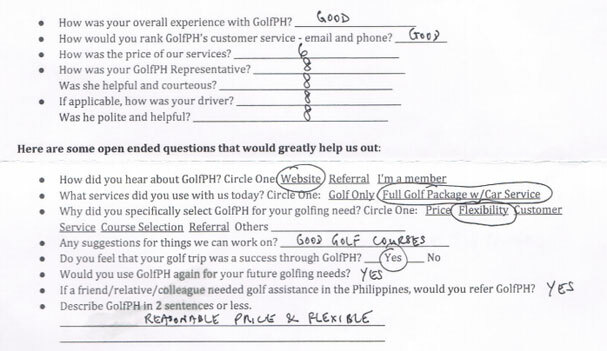 Why did you specifically select GolfPH for your golfing needs? Course Selection. 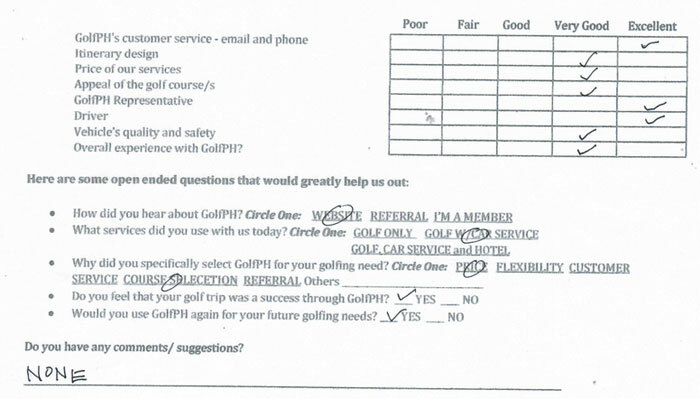 Would you refer GolfPH in the future to a friend/relative/colleague? Sure. Would you use GolfPH again for your future golfing needs? Most likely. How was your overall experience with GolfPH? Very Prompt in your response. How was the price of our services? Fair. 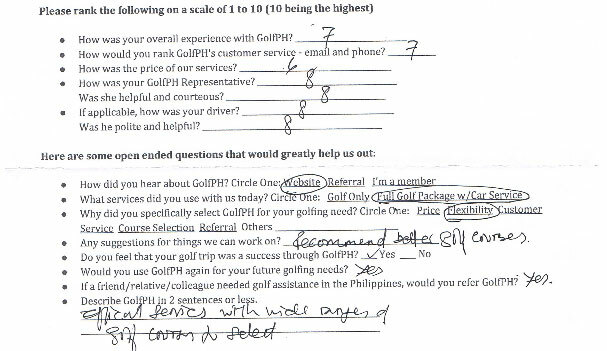 How would you rank GolfPH’s customer service – email and phone? great. 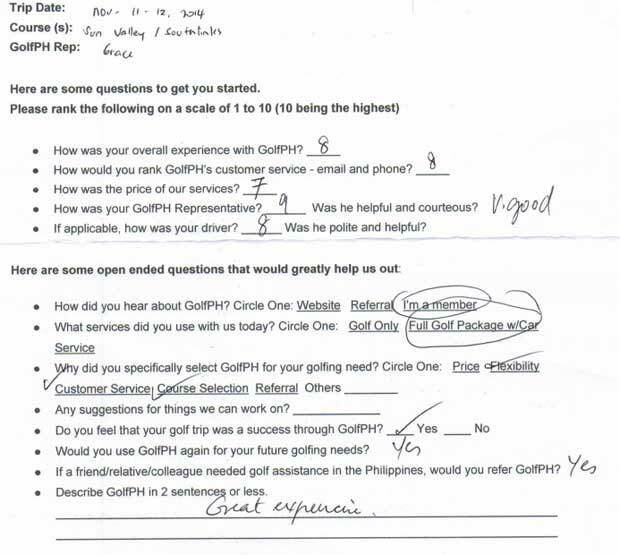 How was your GolfPH Representative? She was very helpful and saw that our arrangements were kept. 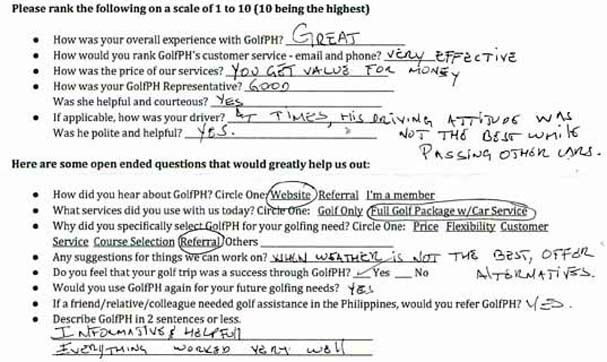 Why did you specifically select GolfPH for your golfing needs? Customer Service. 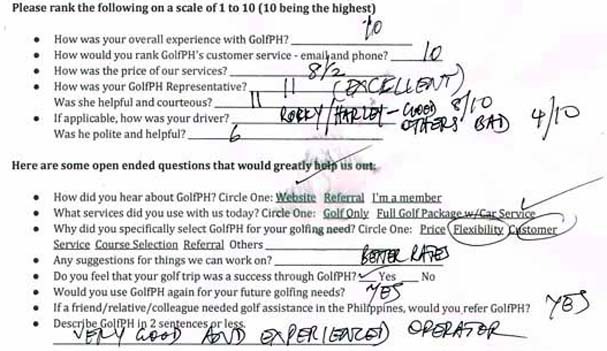 “Of course Golf PH’s work and arrangements were more than perfect and all of us really enjoyed the tour itself. Especially your actions were always quick and accurate. For us foreigners, such actions are very critical and make us easy. 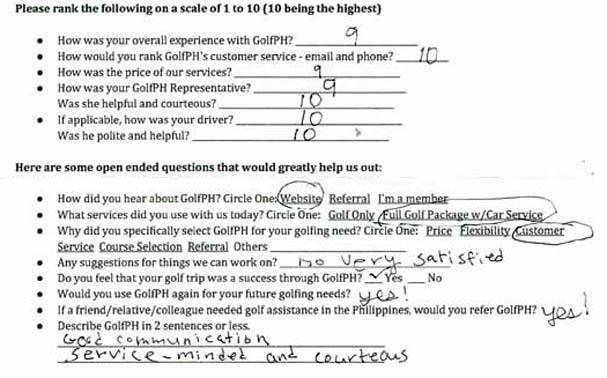 Was your GolfPH Representative Helpful and Courteous? Yes. 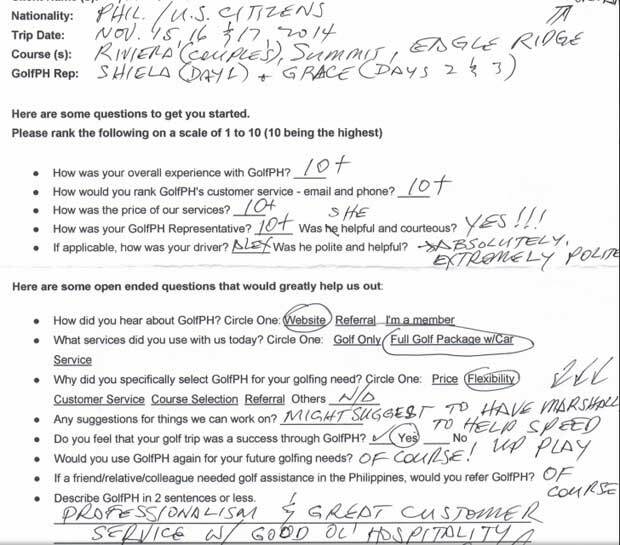 Quick service & punctual & helpful..
My parents were planning a visit for 20 days. Both being avid golfers, I wanted to make the most of their time in Manila. I struggled trying to contact the few public courses that were available… and then I came across GolfPH. Katherine was beyond exceptional in answering all of my questions and concerns. Her responses were prompt and extremely helpful. She was able to get me all of the information needed in a timely manner. 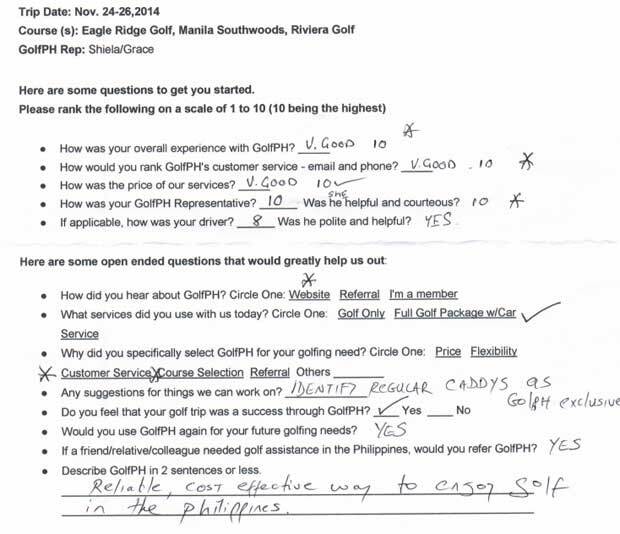 Although my parents trip here was short, they enjoyed the conveniences of GolfPH. My husband and I will certainly take advantage of their services once again. A.M. Levi – USA & Puerto Rico – November 2013 – Golf Package: Capitol Hills G&CC, Eagle Ridge CC (Norman, Dye and Faldo courses), Sherwood Hills, Veterans GC, Canlubang and Club Intramuros. 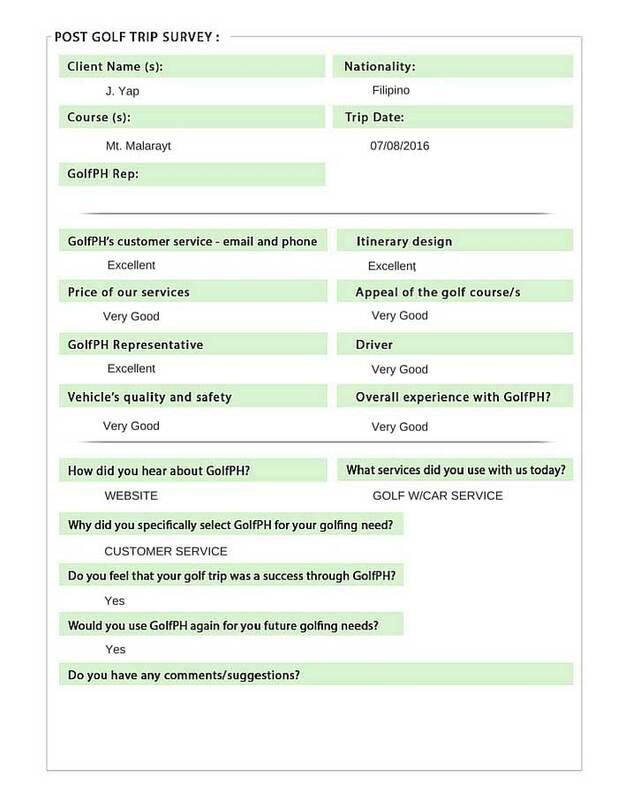 “We had an excellent experience with GolfPH. The service was excellent; every emailed response was quick and efficient (especially given we were organizing an event for 16 people and based in Hong Kong); and the whole day went exactly as scheduled. L. Grant – July 2013 – Golf Package: Orchard, KC Filipinas, Eagle Ridge, South Forbes, Sherwood Hills, Sun Valley, and Forest Hills Golf & Country Club. “Though its been long overdue but I m compelled to write my sincere thanks to you and your team for have made our golf tour to Manila last January a memorable and a pleasant one. You and your team comprising Mayo and Grace are very professional and have very high “customer-oriented” attitude. The personal attention given by both Mayo and Grace are very much appreciated. They are hard-working and very committed to their job and they have good inter-personal skills as well. Being a golf tour company as myself, you made my job so much easier to organize golf tour with a group of demanding people. Your attention and prompt replies to my inquiries are rather admirable. I find your customer service are excellent and made me and all in our group at ease. I know you had taken a lot of efforts to make our trip a memorable one. This tour wouldnt have been a pleasant one if not for your undivided attention and your thoughtful manner in handling all our request and for everything you each contributed. I sincerely thank you for that. I therefore would highly recommend you to anyone who wish to have a golf holiday in Philippine. Highly professional, courteous, and a well organized management system. “I had a great time. Thanks for your excellent service. Prompt, friendly and nice people. From the airport pickup and arrangements… Highly recommended. 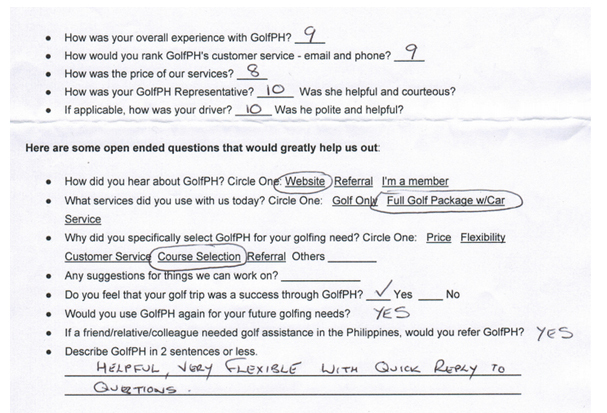 “GolfPH response to my request by email is fast & within same day or 10 minutes during office hours. They can make booking for tee-times on most golf courses in Philippines, even if it is a member only golf club. Transport & hotel can be included as well for hassle free arrangement. We have a cancellation for 1 golfer on the last 2 days of our 4 days golf trip and GolfPH managed to get a refund from an advanced prepayment golf club, if you cancel 1 week in advance. Deposit payment is by Paypal and it’s fast & hassle free, no extra charges. We will definately use your service again and will recommend your service to my Malaysian golfers when they visit Philippines. We appreciate your professional service and conduct in doing business. 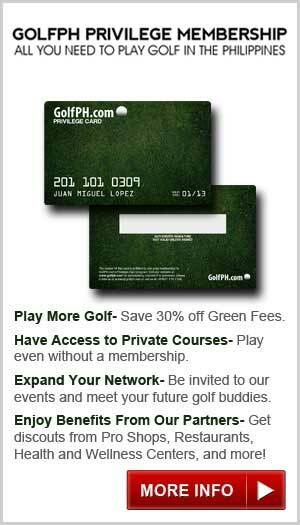 “Just signed up for Golfph membership and the experience thus far has been excellent. Katherine was very knowledgeable about courses around Manila and assisted me in identifying courses that matched my playing ability and budget. The assistance with booking courses alone was worth the membership fee, any expat who has attempted to contact some of the local public courses will likely understand what I mean. “Yeah, we had a great time in the Philippines. Firstly, I must thank you for making my golf booking and arrangement a lot easier. You have provided me with a lot of interaction through emails, which gives the personal touch in our dealing from the beginning until the end. Your fast response to many of my queries and clarifications is very much appreciated. 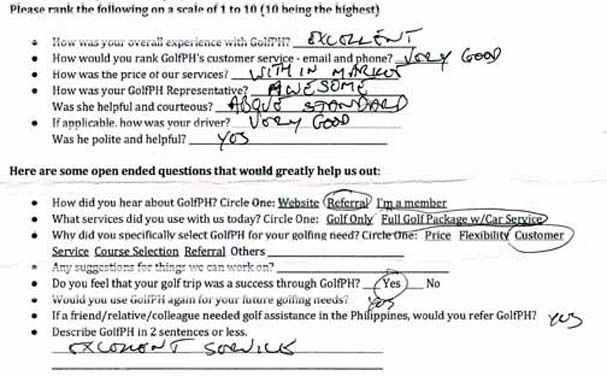 I must say all-in-all my experience with Golfph is friendly, comfortable and professional in the sense that we are not even dealing face to face. I would definitely recommend Golfph to anyone considering a golfing vacation in the Philippines. Also, thank you for letting us having a bigger van, it was a comfortable ride to Spendido. Can you say thank you on my behalf to Noli (he is always cheerful, helpful and accommodating). Thanks to the driver for our safe journey. “If I didn’t have a GolfPH Card I’d be stuck playing at the same public courses. 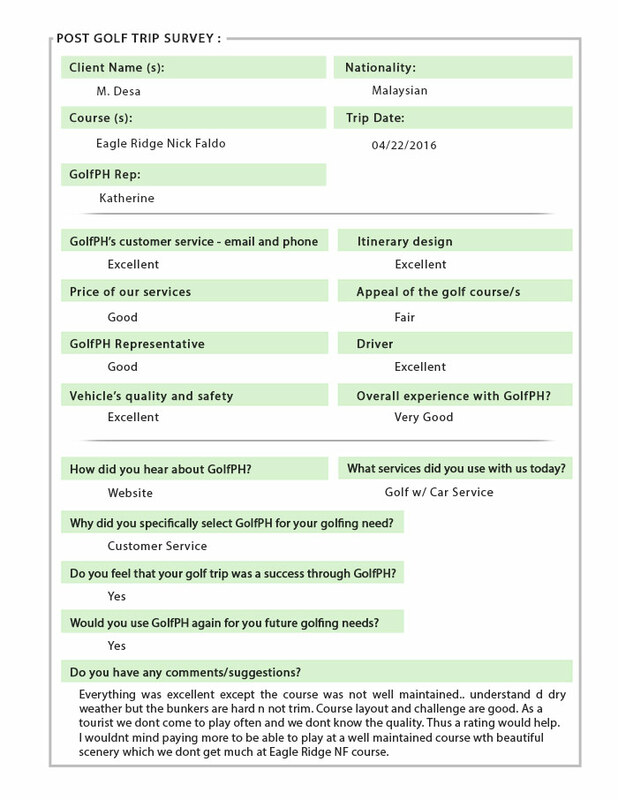 “…everything went well with our golfing experience in PI on this trip. Thanks for the great service.